Pause, breathe and nourish yourself — Pangea’s luxurious, foaming hand wash is a journey into Canadian Rockies where wind in the pines clarifies the soul, and the scent of sage refreshes the heart. Formulated with organic saponified vegetal oils, organic botanical extracts and naturally anti-bacterial essential oils, this grounding, elevating and purifying soap is sure to give you the most satisfying hand washing experience you’ve ever had. 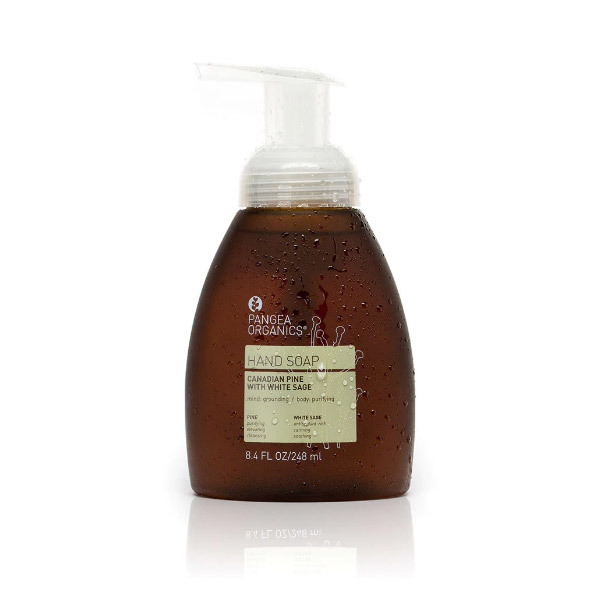 A nutritive substitute for commercial, anti-bacterial soaps without all the harsh detergents, dyes and fragrances, our foaming hand soap is both moisturizing and non-drying, concentrated to last longer and provides a luxuriously rich lather. Comprised of a nourishing blend of organic saponified vegetal oils, organic botanical extracts and essential oils, this foaming hand soap will purify the skin while soothing the senses, all without the inclusion of synthetic sudsing agents, synthetic fragrances or harsh antibacterials. AQUA (WATER), POTASSIUM COCOATE (COCONUT)*, POTASSIUM OLIVATE (OLIVE)*, GLYCERIN, CITRIC ACID, POTASSIUM CITRATE, LAVANDULA HYBRIDA (LAVENDIN) OIL & EUGENIA CARYOPHYLLUS (CLOVE) FLOWER OIL & ABIES BALSAMEA (FIR) NEEDLE OIL & SALVIA OFFICINALIS (SAGE) LEAF OIL, SD ALCOHOL 38-B* & SAMBUCUS NIGRA (ELDER) FRUIT EXTRACT* & PLANTAGO MAJOR (PLANTAIN) LEAF EXTRACT* *ORGANIC INGREDIENTS. THIS PRODUCT IS VEGAN AND GLUTEN-FREE** **MANUFACTURED IN A FACILITY THAT MAY PRODUCE PRODUCTS THAT CONTAIN GLUTEN.